This scarf is imported by York Scarves and they say ...The scarf is handmade in the true sense of the word. It is made from one very long piece of yarn. First the yarn is dyed. 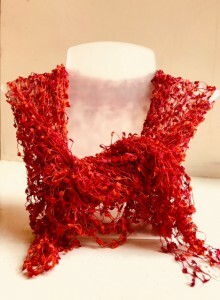 Most of the scarves in this range are multicoloured and this is done by taking a large skein of yarn and daubing a few inches of it with your first chosen colour. The next colour is then added and so on until the whole skein has been dyed. Once the skein is unwound the yarn will change colour every few inches. The finished yarn is then wound onto a wheel. The actual scarf is made by using four straight pieces of wood to create a frame of about 50 x 180cms. Nails are then tapped upright into the wood at intervals of about one inch. The yarn is then drawn from the wheel and interlocked around the nails by hand. The yarns are interlocked at each join with threads running east west across the scarf and running diagonally in each direction. When the finished scarf is taken off the frame and held up you can see that it is made up of hundreds of small triangles. These net scarves are handmade by women. The fact that they can be made with only a few pieces of wood, a box of nails and some training means that even some of the poorest households have access to an income.